AI has the potential to improve drug approval rates, reduce development costs and get medications to patients faster. 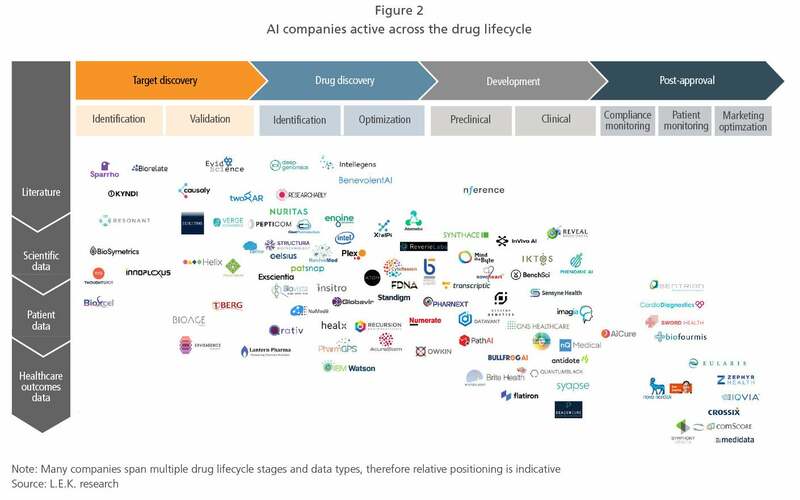 All of the largest 10 pharmaceutical companies are investing in AI, and developments in applications are occurring across the spectrum of pharma business. Given the nascent stage of the industry’s development, creating an effective AI strategy is proving to be complex for pharma players. As they do so, four critical issues should be considered: partnerships with AI companies, data sharing, algorithm transparency with regulators, and data privacy. Artificial intelligence (AI) has the potential to transform the pharmaceutical industry. Each of the major pharma players is investing in the technology at some level, and there are a growing number of applications that address target and drug discovery, preclinical and clinical development, and post-approval activities. With AI comes the potential to improve drug approval rates, reduce development costs, get medications to patients faster and help patients comply with their treatments. Industry executives surveyed by L.E.K. Consulting expect that AI applications will become standard in the pharma operating model over the next five to 10 years. However, at present, the landscape of AI providers and technologies is fragmented, with no clear winners in any application. Creating the right AI strategy will be complex and will often have a steep learning curve, especially given the nascent stage of the industry’s development and the relative lack of case studies documenting success. This Executive Insights reviews the opportunities that artificial intelligence can bring for pharma companies and four key factors that players should address when developing their AI strategy. Using these four approaches, artificial intelligence is set to speed up or replace steps in the drug development process, with the objectives of significantly improving approval rates and reducing the very high level of associated costs. Currently, approximately 90% of all clinical drug candidates fail to reach approval, driving the associated costs of drug development to an estimated $1.4 billion. AI has wider potential to cut the costs of the industry’s research and development (R&D) spend, which for the largest 10 pharmaceutical companies is $67 billion (equivalent to 40% of the sector’s total R&D bill). 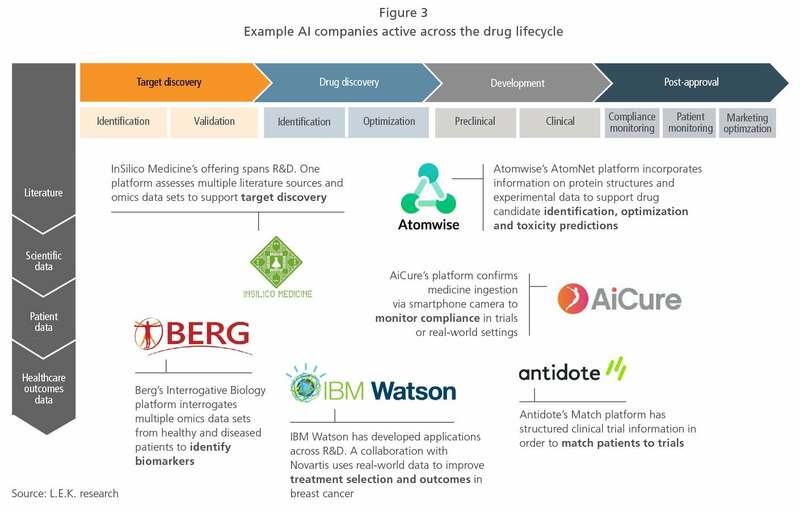 AI’s ability to reduce drug development times is already starting to be realized by big pharmaceutical companies. Novartis, for example, used the technology to combine clinical trial data from a variety of internal sources to predict and monitor trial enrollment, cost and quality. As a result, the company has reported a 10%-15% reduction in patient enrollment times in pilot trials. Accelerated drug development and approval rates can also unlock profits from more years of patent-protected market exclusivity. In addition, AI has the ability to optimize patient support efforts after drugs have been approved. 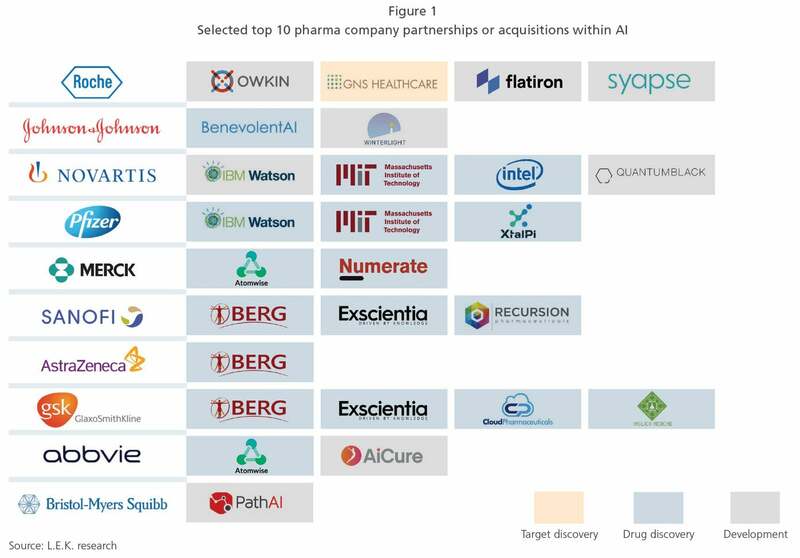 All of the largest 10 pharmaceutical companies (by revenue) have either partnered with or acquired AI companies to leverage the opportunities the technology presents (see Figure 1). While some partnerships apply to clinical trials, the majority focus on drug discovery, reflecting the lower regulatory hurdles for discovery and the more advanced nature of available AI solutions. Developments in AI applications are occurring across the spectrum of pharma business, from target discovery to post-approval activities (see Figures 2 & 3), and are being used to automate processes, generate insights from large-scale data and support stakeholder engagement. Solutions draw on a range of data sources, especially chemical, biological and patient data, as well as literature. BenevolentAI, for instance, aggregates and analyzes literature data to identify and refine drug leads and related target patients. Players such as Atomwise and XtalPi specialize in scientific data (primarily chemical and biological information) that can be applied in drug discovery. Patients’ data is used by companies including Antidote and BullFrog AI to optimize clinical processes such as recruitment and monitoring of patients. Post development, AI applications have been developed for patient monitoring, compliance monitoring and marketing optimization. CardioDiagnostics, for instance, provides tools for wireless heart monitoring; AiCure is a smartphone app that ensures that users take their medication at the right time; and Eularis offers tools for sales and marketing analysis. Novo Nordisk’s chatbot Sofia uses machine learning and natural language processing to field questions from diabetes patients and provide first-level response, learning from each interaction to improve responses for patients that were once handled by nurses at a call center. The considerable promise of AI makes investment a strategic priority for many, as the high levels of R&D spend and long development timelines mean that even small improvements in speed and cost are worth pursuing. Similarly, the growing importance of post-approval activities to support patients and ensure the appropriate usage of therapies will continue to be a catalyst for AI adoption. Meanwhile, AI developers are building and refining applications that address the needs of their pharma customers as the technology evolves. Thanks to these drivers, the use of AI in life sciences (most notably drug discovery) is set to become widespread within the next decade. This trend will lead to a marked shift in pharma’s operating approach, particularly in traditional and time-consuming approaches (such as high-throughput screening) that will be needed less frequently and in a more focused manner. Partnerships with AI companies. Building capability in-house is likely to be challenging and expensive for pharma companies, due to the scarcity of talent with the necessary skill sets in the crosstab of AI and biology. A more effective strategy for many companies will be to build partnerships with leading AI companies. The pharma company will benefit from having an AI solution developed that is specific to its proprietary data, and the AI firm will have the opportunity to learn from analyzing the data, improving its capabilities. Data sharing. Fierce competition within the pharmaceutical industry has resulted in a culture of extremely limited information sharing between pharma companies, with the broader barriers of drug development regulations and compliance standards exacerbating the issue. As a result, some AI projects have been criticized for their lack of data. For example, IBM Watson’s platform for cancer drug discovery received largely negative feedback following allegations that a lack of patients’ data outside of radiology weakened the AI system’s learning and predictive capabilities. Forming partnerships to share data with other pharma companies will help optimize the potential benefits of AI, and with initiatives such as the public-private ATOM (Accelerating Therapeutics for Opportunities in Medicine) consortium in place, there is an increasing momentum to do so. Algorithm transparency with regulators. Transparency with regulators regarding the algorithms used for drug development is vital to their understanding of the processes behind AI-powered conclusions. Without transparency, AI risks becoming a “black box,” resulting in tools not being subjected to rigorous peer review or scientific methods. This could lead to unforeseen issues when drugs go to regulatory agencies for approval, such as the acceptance of biomarkers identified using AI. Pharma companies should also be proactive in working with regulators to agree on acceptable regulatory pathways to the benefit of all. Data privacy. The relative ease of working with non-patient data sets has resulted in AI being more widely adopted in drug discovery than in clinical development. The use of patient data is highly sensitive, and as AI capabilities develop, companies must take the appropriate legal and compliance measures to protect the increasing volume of such data. GDPR compliance in Europe will be particularly important, and failure to comply could have significant reputational and financial consequences. The global pharmaceutical industry is on the cusp of an exciting era, as rapid developments in artificial intelligence present the opportunity to make more effective drugs, faster and at reduced cost. Developing an appropriate AI strategy is beset with challenges and will require pharma companies to work in new ways and to collaborate more closely than ever before. Although it will be some time before the first AI-enhanced drug is approved (given the typical 10-plus years it takes to get from target discovery to a marketed drug), the promise of AI is resulting in broad investment across the industry, and the impact will be far-reaching.